In continuation to our previous article on RAID i.e. 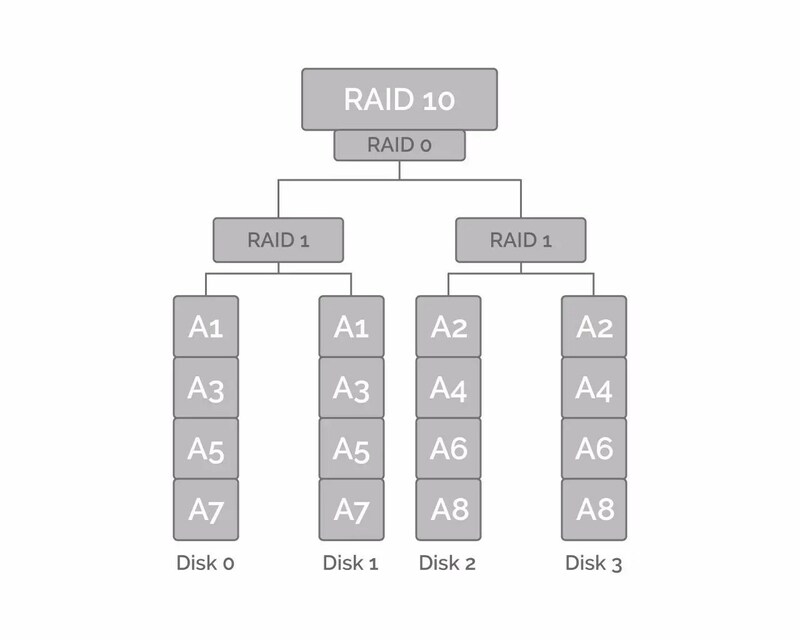 Redundant Array of Independent Disks today we are going to discuss remaining levels of RAID i.e. RAID 3 through RAID 10 or RAID 1+0. So let’s start with RAID 3. It uses storage using striping with Bytes Striping which is similar to RAID 2 which requires synchronization between the Disks. They all have to spin in synchronously in order to store data and it also contains Parity Disk. Parity bits are stored here and their rules can define information about a record that is stored on the other 3 disks here. So you have 3 terabytes in this case as a usable space and one extra parity disk which can explain roles of other 3 disks. If the disk 1 is to die then it would be able to reconstruct that disk based on the records it has and the roles they have. It needs a minimum of 3 drives to operate and you can do good sequential read and write because disks are working synchronously but random read and write would have worst performance. This might be good for large video editing. This is not a commonly used method, it’s just let you know how it works. So there is a one parity disk and 3 dedicated disks for storage on a byte level synchronization. RAID 4 kind of performs similarly to RAID 3. 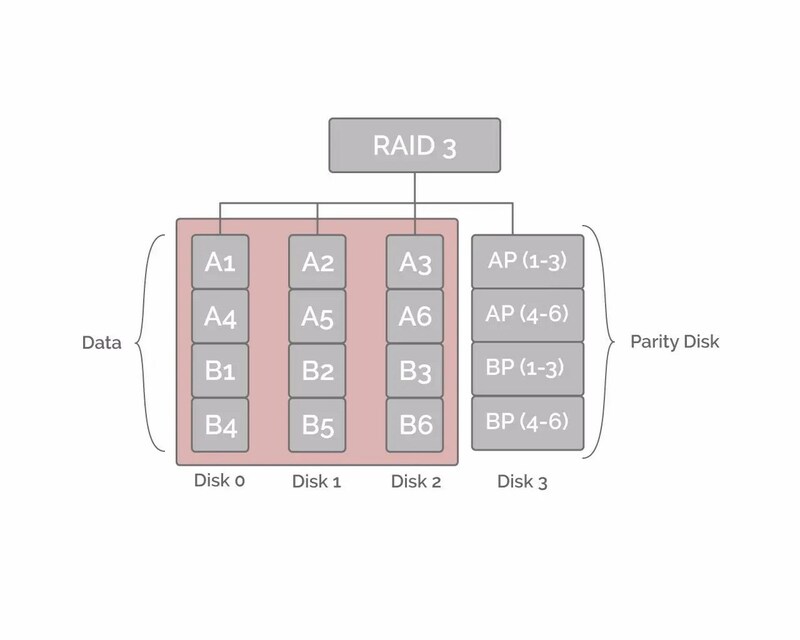 RAID 4 is actually stored or stripped at a Block level and has that dedicated parity disk. You can have good random read because the data blocks are stripped and bad random writes caused because every byte has to write to parity disks. So you are getting that slight delay when you are doing that. It’s far more efficient to go with next RAID level i.e. RAID 5. This is not something that is commonly used but it doesn’t require that spinning and synchronization. Here we are with RAID 5 and it doesn’t have a dedicated Parity Drive which would make you lose terabytes of space. Moreover, we have distributed parity which cannot allow you to lose terabytes of space but you cannot have more space efficiency here by storing across all the stuff. So again when disk 1 is to die you can replace that disk and you can then reconstruct it by the missing records that are available on the other drives and free the rows of that parity disks. This is probably the most cost-effective solutions. You do lose that space; you do get good performance too because it is doing Block level stripping and the operations might be slow because again it has to write that parity information but it’s pretty good for things like databases. This gets a little bit more complex and this is actually geo parity so you are having essentially 2 dedicated parity disks distributed across all of the disks. This is probably more useful if you have a lot more disks as shown in here. Because 2 disks can actually fail your entire set up and you can actually replace them and again using those parity rules. All the records that are available you can then get them replaced and it would be efficient so again in hard disk failure the configuration can be complex though but still that use Block stripping system too. Here we are with RAID 10. This is also known as nested level 1+0. 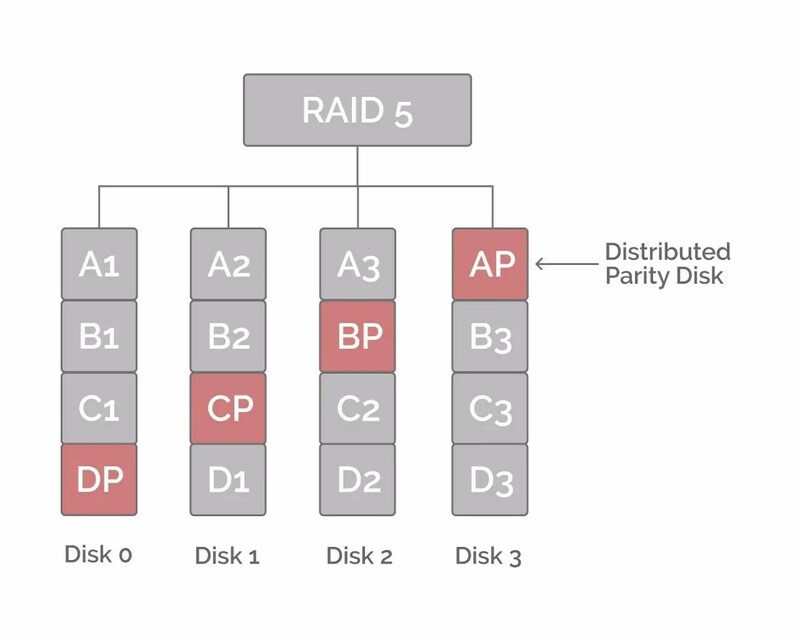 The reason for this is because we have a RAID 1 setup which we talked about in the previous article where we discussed mirroring data, they stand stripped across. 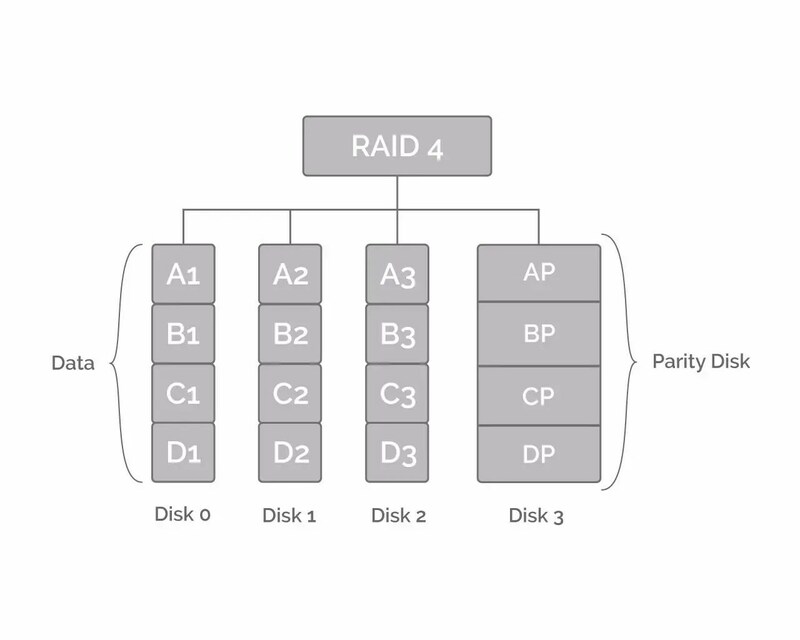 So in this case for Disk1 to die because your system wants to group up because you have that backup with the first drive in RAID 1 and also giving you good level of performance with RAID 0 stripped it only giving you half the usable space in this case so this 4 terabytes space would give you 2 terabytes but it’s very efficient solution because if you are adding more drives and entire pair of drives would need to fail in order to make this drive to mess up. 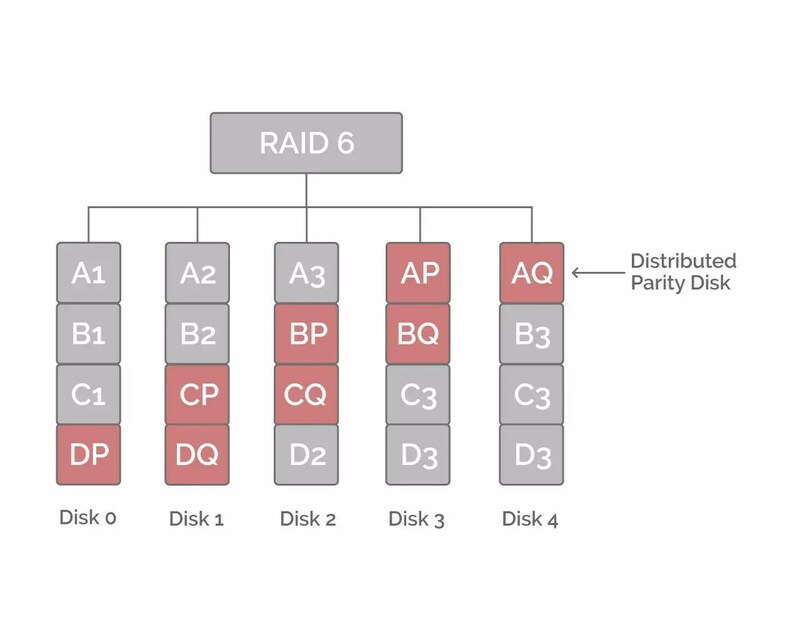 Because this is a nested level and then you have that entire RAID 0 giving you that added performance that you need to require. This is a highly regarded system if you can afford it and if you can afford space loss then it’s worth having a shot with RAID 10. That sums up all the different levels of the RAID, some of them are most common and some are obsolete.